Ausable Chasm, straddling Clinton and Essex counties, claims to be the Grand Canyon of the East. The North Country is a region of the U.S. state of New York that encompasses the state's extreme northern frontier, bordering Lake Ontario on the west, the Saint Lawrence River and the Canadian provinces of Ontario and Quebec on the north and northwest, and Lake Champlain and Vermont on the east. Generally speaking, the North Country is understood to be that portion of northern New York which lies outside the Adirondack Park and consists of mostly level lands or the foothills of the Adirondack Mountains, but is not within the Adirondack range itself. New York's North Country shares with Ontario the Thousand Islands, an archipelago within the Saint Lawrence River. The region is the most sparsely populated but is also the geographically largest, in New York. At the 2010 United States Census, the population of all six counties is 428,357. 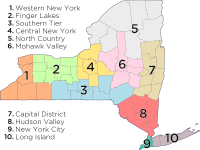 The New York State Department of Transportation defines the northern lobe of the state as part of the Adirondack Region, which includes the counties of Clinton, Essex, Franklin, Hamilton, Jefferson, Lewis, St. Lawrence, and Warren. The North Country incorporates cultural similarities with Canada. The North Country Trail, more formally known as the "North Country National Scenic Trail," is a 4,600-mile (7,400 km) long-distance trail being developed and is proposed to begin at Crown Point, New York on Lake Champlain and traverses New York, Pennsylvania, Ohio, Michigan, Wisconsin, Minnesota, and North Dakota. ^ "Adirondack Region", New York State Dept of Transportation. Retrieved 25 January 2009.